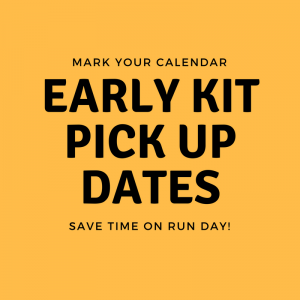 To help you save time on event day, we’ve set up three early kit pick-up opportunities for registered runners and festival-goers. Just pop-in at your convenience and we’ll give you your race kit, shirt, bib (which includes four tear-away beverage tokens) and steins*. If you’ve pre-purchased additional beverage tokens online, you’ll be able to pick them up as well. You will also be able to pick up kits for friends who may not be able to make it down to one of our scheduled kit pick up times. You will need your ID to pick up your race kit. If you are picking up for friends, you’ll need a note from them letting us know it is ok to for you to pick up their kit. Don’t forget! You can save even more time on event day by pre-purchasing additional beverage tokens online in advance. *Steins will be provided to runners at the finish line. Festival-goers will pick up their steins at early kit pick up or at the registration table on run day. Event day pick up will be available from 8 a.m. until 12:15 p.m.